Wire shaving is the process of transforming metal wire into metal wool by drawing it past a serrated blade. This is the first step in the production of nearly every product we produce and the essence of what we do at GMT. But also shave other alloys as required by a specific application. 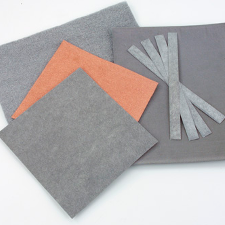 Once shaved the metal wool is either processed into reels, bobbins, pads or fibers to be transformed to the finished requirements of the application. Chopped metal fibers have many applications and are a critical raw material component of a wide range of products. Typical applications include automotive friction such as brake pads. Metal fibers also often added to other materials for strength, abrasiveness or heat transfer. 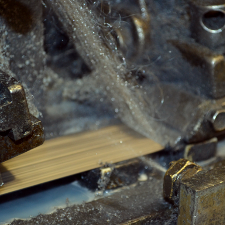 GMT produces chopped fibers, to your specifications, from any of the alloys we shave. Custom blends of fibers can also be created and packaged to your specifications. 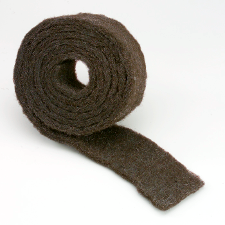 GMT is a leading supplier of metal wool reels, bobbins, and pads to a large cross-section of industries. In addition to a variety of standard configurations and packaging options, GMT can produce and package to your specifications either in bulk for industrial applications or individually packaged for retail under your brand or private label. GMT has the capability to blend fibers to create a finished product that can conform to exacting specifications. Needle punching is a method of creating a non-woven fabric in which fibers are interlocked by punching barbed needles through a web of fibers. GMT’s non-woven production facilities include multiple needle punch lines capable of producing high strength metal fiber fabrics of varying densities that are ideal for filtration media, geo-textiles, and other industrial applications. Air-laying creates a web of randomly oriented fibers that can be bonded by sintering or adhering to a substrate. With this process, GMT is able to produce metal fiber fabrics through a high range of basis weights and densities. This is also an ideal process for applications requiring a blend of materials. This process can be applied to a variety of fibers including ferrous and non-ferrous fibers such as bronze, copper, brass. This process is ideal for filtration and thermal transfer applications. GMT’s cross lap capability allows for the creation of uniform webs for needle punching. The bi-modal fiber orientation allows for the creation of fabrics with strength in the X, Y & Z directions. Additionally, the cross-lapping process facilitates the creation of higher loft webs. Typical applications for this process are buffing and polishing, filtration. We have the ability to card ferrous and non-ferrous metallic fibers, including bundle drawn fibers, as well as a blend of metal and synthetic. GMT’s sintering operations allow us to create a wider variety of material to meet specific demands of many high-performance applications. Typically, the sintering process enhances desirable properties of the material such as strength, electrical conductivity, and thermal conductivity. This can be particularly effective in filtering applications where material strength can be enhanced while maintaining porosity. 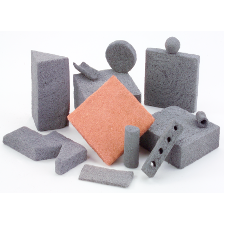 Sintering is also useful in applications where fall-out of filter media is a concern. Sintering can also create high volume, low-density forms. A textile finishing process useful for ensuring the material has a uniform surface and thickness. This process is often utilized in the manufacture of precision filter and other components. GMT’s in-house die cutting operations speed production and enhance quality control. Our die cutting operation is capable of producing a finished piece with dimensions up to 33” x 48”. GMT’s production facilities are capable of producing multi-layered materials through adhesive lamination or fusion bonding with a binder such as low-melt poly. By needle punching a pattern into a metal wool or metal wool and poly blend material can improve a material’s performance and add strength. Texturizing is also useful to improve appearance or add a distinguishing characteristic to a material to create product differentiation. GMT’s roll coating capability allows us to add a functional coating to the surface of the material. Sometimes what you need to bring your project to life doesn’t exist in anybody’s product catalog. Or, if it does exist, it may not perform to your standards or specifications. GMT can help. For over 100 years our customers have been asking “Can you make it?” and we’ve been answering “Yes.” No matter if you are starting with a complete specification or simply an idea of the desired functionality, our R & D, production, and sourcing, teams have the expertise to make your project a reality. GMT currently manufactures a multitude private label products, representing over 140 million units annually, for some of the nation’s biggest, most well-known brands and retailers. Why choose GMT for your private label project?